Want to be your own boss, set your own hours, and pursue your passion for wildlife? 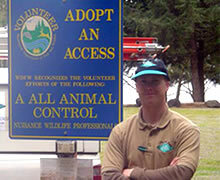 There’s never been a better time to own your very own animal control franchise with A All Animal Control, a top low-cost franchise, and get your career in wildlife headed in the right direction. We make it easy to turn your dreams into a reality and make your business a success. You’ll get a one-week training from our highest selling franchise, a start-up equipment package including business cards, uniforms, software, access to our extensive online operations manual, marketing support, a franchisee mentor, and more. And once you’re out of training, the support doesn’t stop. We continue to provide you with marketing and training support, including internet marketing, montly training conference calls, a frequently updated operations manual, and a yearly conference where the whole franchise comes together.